In 1967, widowed mother, Alice Zander (Elizabeth Reaser), and her two young daughters, Lina and Doris, add a new prop to their struggling seance business - an ouija board. However, their unwitting actions invite something truly evil into their home. When Doris (Lulu Wilson) is overtaken by a merciless spirit, the grieving family has to face its fears and try to send the demonic possessor back from whence it came. Click Here For Weekly Movie Reviews! 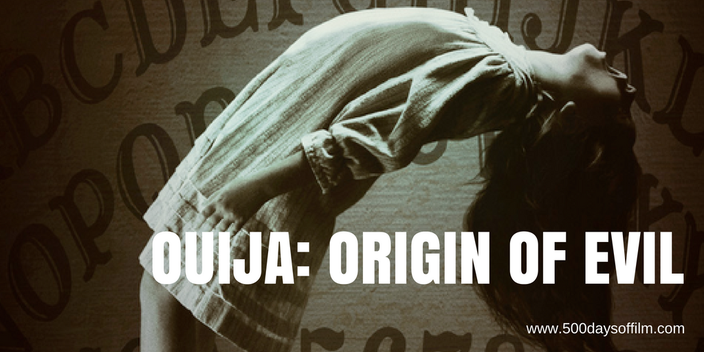 Directed by Mike Flanagan, Ouija: Origin Of Evil is the prequel to 2014's Ouija. However, this new story, set in 1960s LA, works on its own, so do not worry about watching the first movie (really, life is too short). I enjoyed Ouija: Origin Of Evil for two reasons. First, the film is full of classic 1960s fashion and paraphernalia. Cool. Indeed, the movie itself has been made to feel like a film from that era. It is full of (faux) film jumps and reel cues (the mark that used to tell projectionists it was time to change the film reel). Second, Flanagan takes time to make you care about the Zander family. I admire this tactic - you scare because you care, right? And you do care, thanks to the strength of the film’s cast. Elizabeth Reaser is engaging and convincing as Alice, Annalise Basso is impressive as older daughter Lina and Lulu Wilson is suitably unsettling as Doris. In addition, it is always good to see Elliot, I mean Henry Thomas, on the big screen as the kindly Father Tom. However, Flanagan takes too long to establish his family dynamic. It almost feels like he loves the Zanders too much and is, therefore, reluctant to let the evil truly take hold. As a result, while watching this movie, I became conscious of its short running time (1 hour and 39 minutes) and started to wonder when (or if) the horror was ever going to begin. Unfortunately, when it does, Ouija: Origin Of Evil rushes to its dark denouement and, bar the inevitable series of jump shocks, this film proves not nearly scary enough. Have you seen Ouija: Origins Of Evil? If you have, what did you think about this film? Let me know by leaving me a comment in the box below.